In this post I wanted to shine a spotlight on two cheery Spring favourites of mine; the sunny hued Gorse flower and spring wonder-plant Dandelion. In this post I will be sharing my favourite recipes, ways to identify these beautiful wild spring edibles as well as herbal remedies. This herbal spotlight is a regular series here on this blog and also on my podcast, with last month bringing a focus on another beautiful wild spring edible wild garlic and three cornered leek, so be sure to check that out it you haven’t already. When it comes to Dandelion and gorse flower I cant really remember a specific first experience of either of these spring plants. Although Both were certainly synonymous with my country childhood. Dandelions were make believe clocks when their seed heads were ripe, they had pretty flowers to pull petals from and bitter greens to feed to various pets. As for gorse this wasn’t so much a friend but more like foe! It would constantly scratch us and block our adventures through scrub land and forest edge. However, despite this the smell of gorse was always a favourite of mine, that strong coconut scent filled up so many of my childhood days and never fails to make me feel quite nostalgic when it comes into bloom in Spring. When it came to culinary adventures with both of this plants It was only later on that I began to use them in my kitchen. 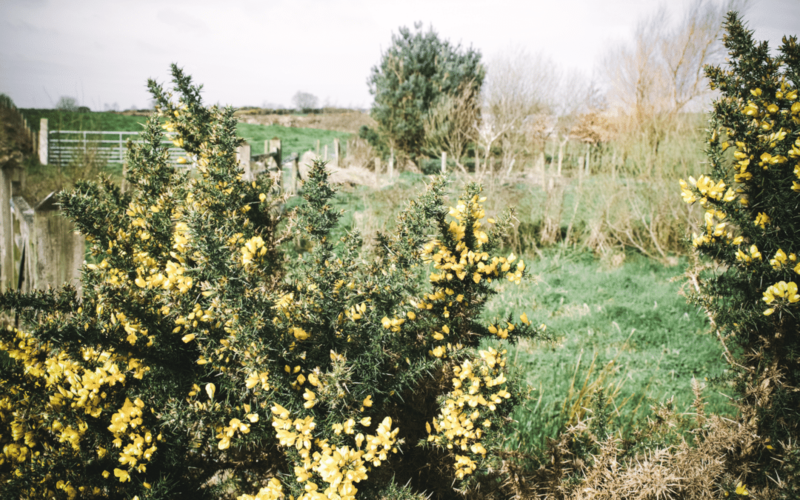 It was in our first year that we cooked down at Ballymaloe in co. Cork that I decided to use gorse flowers in a spring foraged salad with hawthorn buds. They then became a regular thing in my own salads, then on cakes and now infused. Dandelion also came to my kitchen later on when I became interested in herbalism and began to study it. Dandelion then became a favourite spring green in my cooking and a lovely addition to infusions and bitters. Now dandelion has become one of my favourite herbs and wild edibles. The taste of their bitter leaves, the honeyed flowers and strong root are all flavours I enjoy immensely. The bright cheery yellow is also very welcome dotted about on my lawn any day! Dandelion or Taraxacum Officinale is a hugely abundant perennial herb, although some would call it a weed as it favours lawns and parks and is the bane of any neat gardeners life-not mine I should add! It grows year round but Spring time is the best time to make the most of it’s lovely flowers which have a plethora of uses. The leaves are best eaten when young too so look for the smaller leaves and avoid the larger leaves as these will be very bitter and unpleasant for culinary use. As for roots these can be harvested in autumn for the best prebiotic qualities (they are packed with inulin) and are ideally harvested from 2 year old plants. Older roots can be used medicinally and young roots wont stretch very far so a 2 year old plant is a happy medium. Of course it can be hard to tell what age a plant is, but my advice would chose one not too large and go from there! Dandelion is a respected salad leaf in many countries and is very popular used in pasties and salads in Lebanon, a popular bitter salad leaf in France and in some places even grown in darkness to create a pale and milder leaf. Dandelion is pretty easy to identify and a plant we are almost all familiar with. There are a few similar plants about so as with any plant you wish to forage for it’s important to get a good guide book and make sure you are picking the right thing. I really recomend Richard Mabey’s Food for Free book as a good all round foraging book. When it comes to identifying dandelion it’s leaves are long, hairless, dark green and lobed irregularly. It is thought that these toothed leaves are the reason for the French name dent-de-lion, teeth of the lion. Dandelion leaves come directly from the plants Basel rosette (aka right at the base of the plant near the ground) and never from the stem. As for It’s stems they are quite thick and also hollow and will give off a white sap when broken. Stems are usually tinged a rosey pink but not always. Each stem has one bright yellow flower on top, large in size with multiple thin petals. These flowers open and close with the sun and will go to seed on around day 4. Buds and flowers are also edible. Dandelion has a long tap root that can used in beverages and also eaten cooked and raw. Older roots will be woody and knarled while younger roots will be filled out and fresher looking. If the plant is too young the root will be very small. When it comes to dandelion look-a-likes Chicory in particular can look very similar to dandelion before the flowers appear. Although once flowers do appear you wont mistake them as Chicory flowers are a pretty blue colour. Sow thistle , hawkweed and cats ear also have similar shaped leaves so make sure you get the hollow stems, basel rosette, and flowers ticked off when foraging. Like always, when foraging ensure you pick from an area that hasn’t been dozed in weed killer to near a road. You shouldn’t find it too difficult to source a healthy crop though! While I’ve already mentioned a few ways that dandelion can be used its also worth noting that Dandelion is a brilliant medicinal herb and digestive tonic as well! Dandelion is iron rich, full of potassium vitamin A and C and a great addition to our diets especially after a long winter when we are in need of a digestive boost and cleanse. It’s the leaves and roots that are primarily used for health reasons although the flowers do contain nutrients too. Dandelion is beneficial for water retention, digestive issues, as a liver tonic and mild laxative and to increase urination so good for those struggling with UTIs. Dandelion with its cleansing properties is also good for the skin and joint issues. My favourite way of consuming dandelion in a health benefiting way is to use the root as part of a bitter. I then take this before and after meals to promote better digestion. Another nice recipe to have a hand is to make a dandelion balm to aid skin healing. This takes a little time but is easy to put together. Apart from in remedies Dandelion can be used in plenty of ways in the kitchen. The Dandelion root can be used dried and roasted as a coffee alternative, and similarly added into a tea for a bitter kick. It can be fermented into a beer. Young roots can also be used to flavour salads and are good sliced and roasted. Dandelion flowers can be battered and eaten as fritters, infused into syrups, used as decoration in salads and cakes, and buds can be pickled. They can also be fermented to create wine. Pick a double handful of open, fresh dandelion flower. Remove the green petals at the base (bracts) Make a simple batter mixing 1cup flour, 1/2 tbsp baking powder, pinch of salt into a bowl. Make a well in the centre and gradually mix in 1/2 bottle of beer. Dip the flowers into the batter coating them well and fry in a pan of hot oil until golden and crisp. Yum! As for dandelion leaves these are best served wilted and combined with rich, fatty flavours for the most delicious effect. There is a well known salad popular in France which combines the leaves with bacon and sounds delicious! You can also make a lovely dandelion pesto with the leaves. Before we finish up this episode I wanted to also talk a little about gorse flower. While gorse doesn’t have as many uses or benefits as dandelion I still love foraging for it in Spring. It’s delicious soft coconut scent is perfect for infusing into milk, water, honey and syrup which can then be used in baking bringing that scent of a warm spring days to your kitchen. Gorse bushes are pretty much everywhere here in Ireland. They edge fields, spill out into lanes and love coastal areas. The bushes have very thorny stems, with little yellow flowers nestled safely between the woody thorns. It does take a little patience to pick them but I think it’s well worth it. As I’ve already mentioned gorse is just beautiful infused into a base. Infusing is very similar to making a tea, you place the flowers into a liquid of choice, for example milk, bring it to a boil and let it infuse for a few hours. Then strain off the flowers and use your infusion in cakes, biscuits and so on. You can also use gorse flowers as a pretty decoration through salads and on cakes. Just make sure you have clean flowers and remove the furry base. One of my favourite recipes using gorse is a simple gorse sugar. This is great for getting that yummy gorse flavour into baked goods. It can also be used to top cookies before they are baked for a crunchy and flavoursome topping. Simply add equal quantities of clean gorse flowers with the furry base removed to equal quantise of sugar (example one cup of each). Blitz well in a food processor and use within a week for best results. Another lovely recipe to try is a gorse honey. This will have lots of lovely flavour and is perfect to top icecream, yoghurt, granola and so on. PS: if you are looking to get started with Natural living, be it making a spring herbal vinegar, reconnecting back to nature or detoxing your bathroom and making your own DIY toothpaste I have the ultimate resource for you. 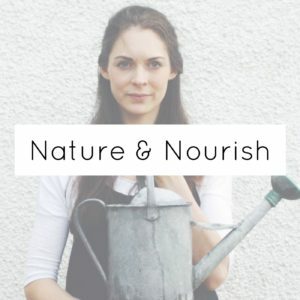 Its my Natural Living eCourse which is crammed full of fun and inspiring ideas and projects to get you living a seasonal and natural life! If your interested then head over and check it out!